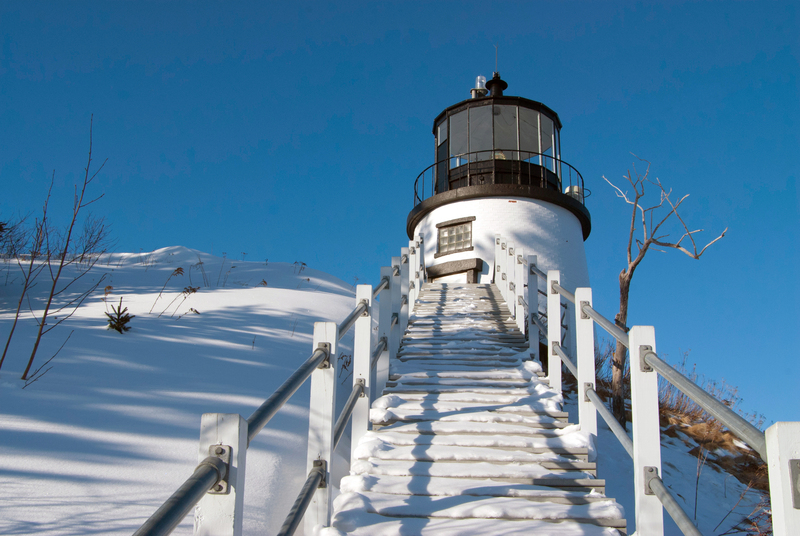 Owl’s Head Light after snowfall, Owl’s Head, Maine. 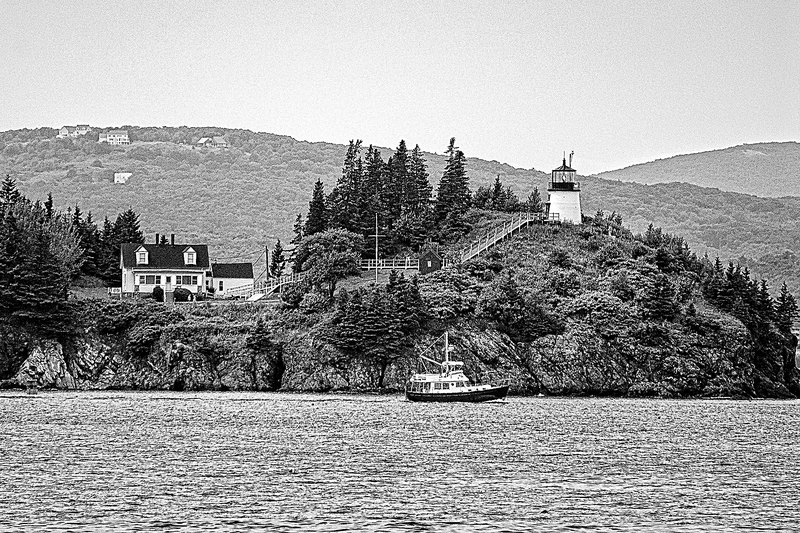 Owls Head lighthouse sits atop a large rocky cliff guiding ships as they enter Rockland Harbor in Maine. 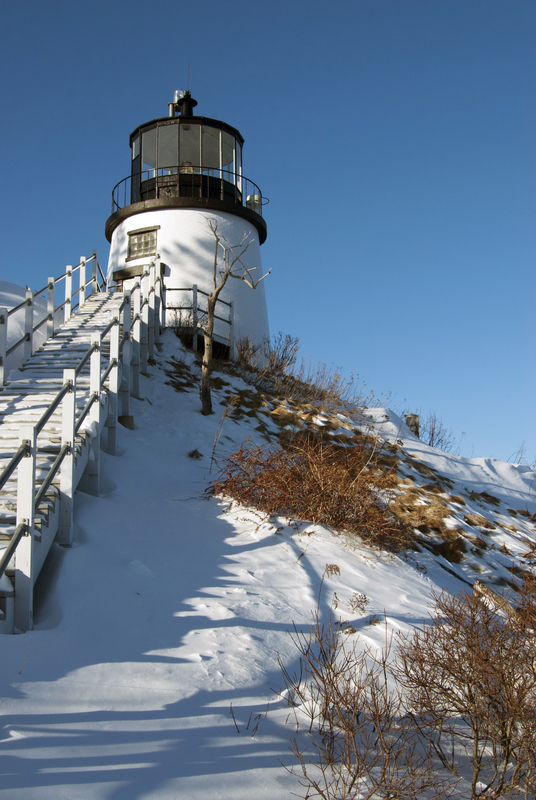 In the 1930’s, Keeper Augustus Hamor, of Owls Head Lighthouse, had a special dog named Spot. The intelligent springer-spaniel was taught by the keeper’s children to ring the fog bell by tugging on the rope to the bell with its teeth every time it heard a ship’s whistle. The dog’s entire life seemed wrapped around the family at the lighthouse, the fog bell, and the ships that would pass by the lighthouse. Spot would spend the day watching for ships passing near the lighthouse, and then would ring the fog bell when they approached near the cliff to warn them of the impending danger. When the captain of the boat returned the fog signal, Spot would happily run down to the water and bark until the boat was out of earshot. 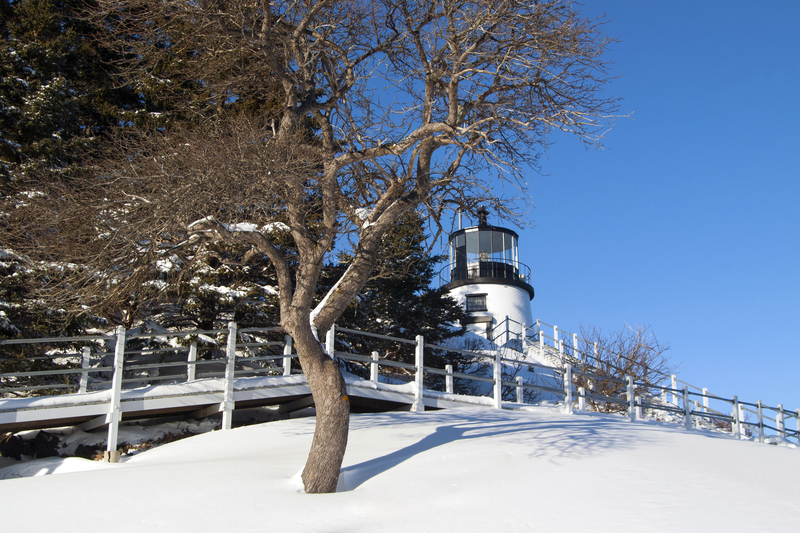 Owls Head Lighthouse sits atop a 100 foot cliff. Spot’s favorite vessel was the mail boat that would make daily runs to various islands, including remote Matinicus Island, which was a long fifteen miles from the mainland. 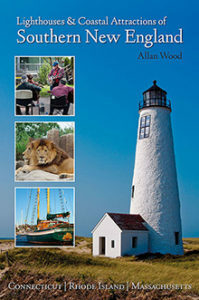 Because of its daily schedule, Spot knew the mail boat’s engine sound and when it would pass by the lighthouse. Captain Stuart Ames of the mail boat was also very fond of the animal and its owners and would always bring special treats when he visited the Hamor family. 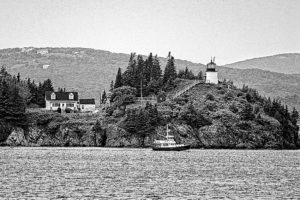 Each time the mail boat passed Owls Head Lighthouse, the skipper would give a toot for Spot, and the dog would answer by ringing the fog bell, and bark until the boat was out of site. One wintry stormy night a fierce blizzard pounded the Maine coast and covered it in a blanket of deep snow. Keeper Hamor stayed in the light tower but visibility was poor with near white out conditions from the storm. As the following day wore on, fewer vessels passed by the lighthouse as most had already found shelter in the nearby harbors. The fog bell was buried in deep snowdrifts and remained silent as no one could access it in the storm. As nightfall approached, Keeper Hamor felt it safe enough to leave the tower to quickly join his family for a much-needed dinner. 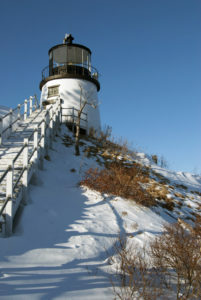 Owls Head lighthouse after snowstorm. As the Hamor’s were preparing to eat, the phone rang with a desperate call from Captain Ames’s wife who indicated her husband was over two hours late and asked if he had passed by the lighthouse. The dog recognized the woman’s voice and listened to her tone. Keeper Hamor replied he had not seen the mail boat. Knowing of Spot’s keen listening abilities, she asked the keeper if he could allow Spot outside in the blizzard to see if he could hear her husband’s whistle, which they gladly obliged. Spot disappeared in the blinding snow and went down over to the fog bell to listen for the boat’s whistle, he sniffed around but could not find the rope. He stayed around the bell buried in huge snowdrifts and returned back a half hour later, cold and tired. After warming by the fire, he grew restless, whining softly knowing something was wrong, as he had not heard the mail boat on schedule. A few hours passed as Spot prepared to fall asleep. Historic Owl’s Head Lighthouse sits on a snow covered cliff in Maine. All of a sudden, Spot jumped up from his cozy warm corner as he heard the distant whistle of the lost Matinicus mail boat, which was caught in the storm trying to get home. He pawed at the door to be let out, which Keeper Hamor reluctantly opened to the storm, as Spot ran out into the drifts. Lunging over the snowdrifts, Spot again was unable to find the rope to ring the fog bell, so he ran to the edge of the cliff barking constantly as loud as he could. Keeper Hamor and his daughter Pauline got dressed and followed out to join Spot who was still barking by the edge of the cliff in the snowdrifts. They could hear the faint whistle of the mail boat as Spot continued to bark and yelp while the boat came nearer through the storm. Spot would continue to bark as the boat neared the cliff. Captain Ames on the mail boat, hearing Spot’s barking, gave three blasts of the whistle to signal back that he had heard the dog. Two hours later, Captain Ames’s wife called to thank the Hamor family, and especially Spot, in helping her husband reach the harbor home, averting what could have been a disastrous situation. Spot is credited with saving the captain and the mail boat that night and is buried near the fog bell he loved. 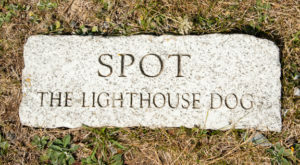 Over the years as the fog bell was removed, and the grave lay in a place that the many visitors to the lighthouse could not find, in 2004, Spot was given a new marker by Paul Dilger, the Coast Guard commander who resided at the lighthouse. 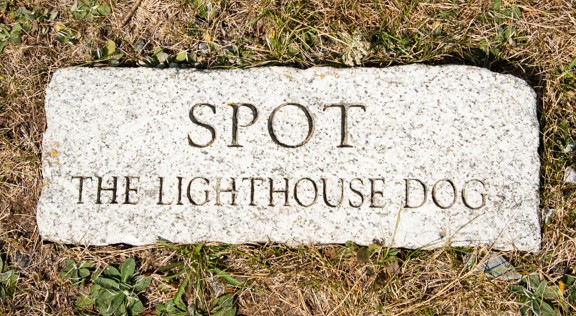 The marker read “Spot, The Lighthouse Dog” to remind those of the animal’s heroic efforts. On a special note, our family’s dog has been with us for over eight years, and her name is Spot. Love her! 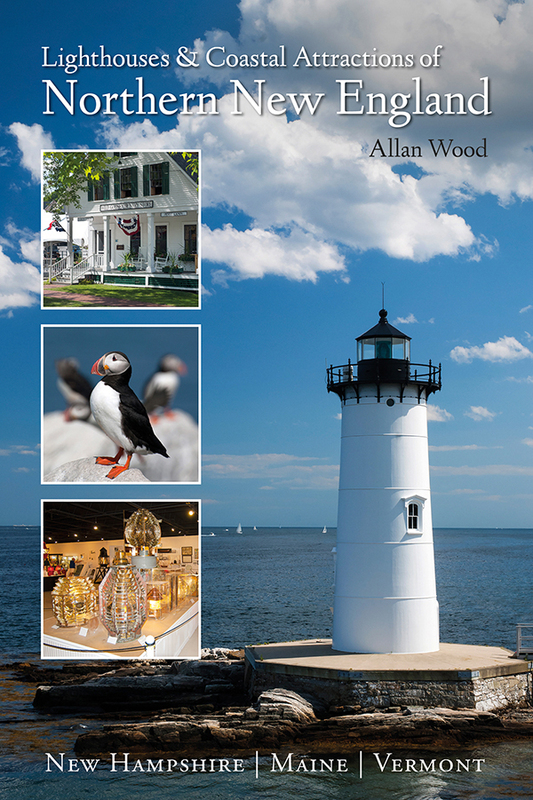 In Rockland, the Maine Lighthouse Museum is one of the most famous lighthouse museums in the world. It contains one of the largest collections of Fresnel lenses in the country. Take a walk along the unique 7/8-mile breakwater out to Rockland Breakwater Lighthouse for a nice hike. For those who want the true Maine flavor, there is the annual Maine Lobster Festival in Rockland with the world’s largest lobster pot, cooking tens of thousands of pounds of lobster around the first week of August. Lots of nightlife too, especially if you love blues and rockabilly music. The Sail, Power, and Steam Museum offers a unique experience of on the waterfront involving scale models of various sailing vessels and ships, steam engines, folk music entertainment, and the art of boat building. 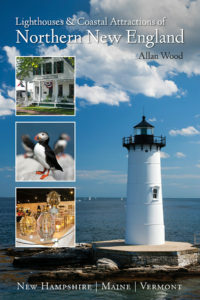 Visitors will find plenty of windjamming, whaling, and special sailing excursions out of Rockland Harbor.